Mac, Lyell’s very first labrador. Mac was a true gentleman. A beautiful nature and lovely made dog. 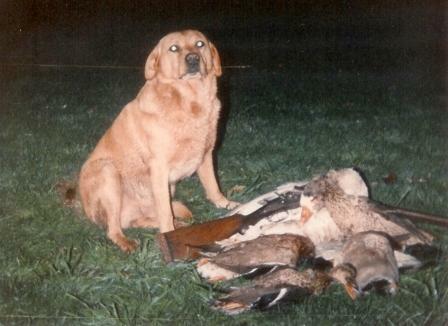 Lyell and Mac used to disappear for hours on end away shooting rabbits and hunting ducks. Unfortunatley never left any puppies to carry on his lines. Mac carries some of the very first Flagstaff lines. Our Kennel name Flagstaff was started by Lyells grandfather Jim Penno, well known in Field trialling. We will always have special memories of this lovely dog.